Dr. Mikalov is a breast specialist who has been in practice over twenty years. His office is located on the eastside of Columbus, Ohio. 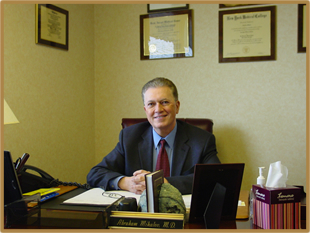 He is dedicated to providing the finest state of the art minimally invasive breast care. When you come to our office your evaluation will include a holistic approach to the management of your breast health incorporating a thorough history and physical exam along with imaging technologies such as an office ultrasound and minimally invasive diagnostic technologies. Dr Mikalov believes that it is his job to be a strong patient advocate expediting evaluation, treatment options and education for patients. When surgery is needed Dr. Mikalov handpicks only the finest institution and surgical team who will serve your best interest. Since we believe that your breast health is intimately connected to your general health we work with you to make the necessary healthy lifestyle changes that will positively impact your health and reduce your chances of developing breast cancer and other illnesses. We accept most insurance plans and the majority of patients today do not need a referral from their primary care doctor. So be proactive with your health and make your own appointment by calling 614-367-1234.